HDR projects makes the most technical of your recordings and does almost all the work on its own. Benefit in several ways: Reduce the effort on the set, edit your images without having to operate a single slider, and still create images with a brilliance you’ve never seen before. – New: Now even sharper and still colorfast! Relaxed photography: perfectly exposed images in every situation! HDR has always been the guarantor of the very special photos, now it’s even easier to get your personal favorite results. The key is the newly integrated personal image styles. You adapt your developments more precisely to your own taste, you experience no unpleasant surprises and quickly get an excellent result. Optimizing images has never been easier! + Time saver: fast success guaranteed! EXCLUSIVE in the professional version! The technical non-plus ultra is just good enough for you and you are a fan of full equipment? You do not compromise on image editing and still the time factor plays a big role for you? + Support for D65 color spaces, equivalent to the standard light for mid-daylight in the midday northern sky and ensures extremely colorfast daylight shots. + Export Exposure Series: Create a bracketing series from a JPG or RAW that you can edit in any other program. HDR is better than any camera sensor! You photograph a scene and wonder that the picture on the monitor looks somehow different, somehow boring? HDR technology helps out of a tight spot! Take several pictures with different exposures, you do not need a tripod! Or – even easier – use even a single image. 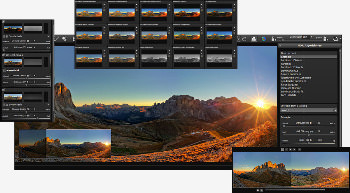 Load your images into HDR projects and let the program assemble the images. The HDR technology leader goes one step further. For the first time, an HDR program with Smart Detail Enhancement (SDE) is working. This intelligent detail enhancement detects noise or other image disturbances in the image. And exactly this noise information is then excluded in the detail enhancement – the actual HDR process. It only reinforces the image information that deserves it. Dirty HDR images are a thing of the past! Many ways lead to HDR projects 2018 professional, from now on also very comfortable from Adobe® Lightroom! A new, full-featured filter plug-in for Adobe® Lightroom and Photoshop provides maximum comfort for your personal workflow. Simply select the desired image or image series in the Lightroom image database, export to HDR projects 2018 professional, edit and place the result image back into the database. The composing feature, a highlight of the HDR projects family, was further enhanced with the 2018 release. You now have the option of providing the image parts with changeable textures. The result is even more spectacular image impressions and even more creative possibilities in image manipulation. Each person has his own style, his own preferences his individual no-gos. The new image styles in HDR projects 2018 will help you to live out your preferences. You choose your favorite style out of 5 photo styles or moods, and HDR projects 2018 then applies this information to all built-in image presets. Your advantage: All image examples are aligned according to your personal preferences, you get a lot more picture examples to see that they will really like. With HDR projects 2018 professional they hold 10 years of HDR know-how in their hands and benefit from technical progress. For example, color casts, even light ones that attract only experienced eyes, are a thing of the past. Newly developed algorithms ensure that existing color casts are automatically corrected in the image.